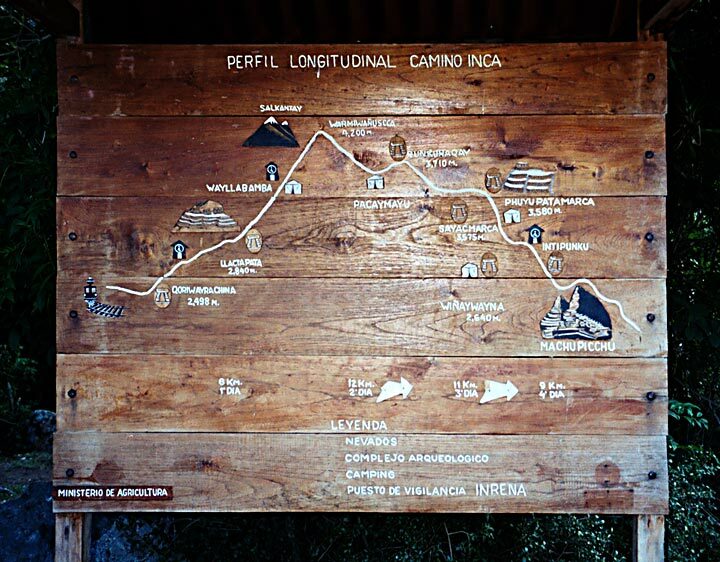 The longitudinal profile map shown below is a photograph of an actual map that hikers encounter along the Camino Inca. The map illustrates important features along the Classic Inca Trail and their elevations. As seen below, the Inca Trail begins at Qoriwayrachina (2,498 M) and proceeds to the ruins of Llactapata (2,840 M). Trekkers generally spend the first night camping near Wayllabamba ("Place of Good Pasture"). On the second day, trekkers climb the Warmiwañusca ("Dead Woman's Pass") at 4,200 M. The second night is spent near Pacamayu. On the third day, visitors see Runcurakay, Sayacmarca, Phuyupatamarca, and Wiñaywayna Incan Ruins. On the fourth day, trekkers hike onward to the Intipunku (Sun Gate) and Machu Picchu.